Many people are cited for a traffic violation at least once in their lives. To most people, a traffic violation is considered a small offense which does not require much attention; however, traffic charges are much more serious than most people realize. If a traffic violation is not dealt with properly, it can lead to points on an individual's driving record, increased insurance rates, and the suspension of an individual's driving privileges. The Law Office of Nikole M. Wynn provides focused and efficient representation for all types of traffic cases in Western New York. Whether you are charged with speeding, passing a red light, texting while driving, or more serious violations like passing a school bus or reckless driving, Attorney Nikole Wynn is here to help! In addition to representing individuals charged with traffic violations, The Law Office of Nikole M. Wynn also provides representation for criminal matters in Western New York. Being charged with a crime is a stressful and overwhelming time in one's life. It is important to have an attorney in your corner who is not only knowledgeable, but who is also compassionate, responsive, and detail-oriented. 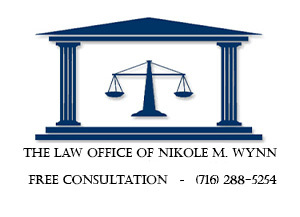 The Law Office of Nikole M. Wynn provides quality legal representation to individuals facing criminal charges. Whether you are charged with petit larceny, possession of marijuana, harassment, or driving while intoxicated, The Law Office of Nikole M. Wynn is here to guide you through the process and put your mind at ease. Whether you have been charged with a crime or a traffic violation, you want an attorney who will fight for you and who will also provide compassion and understanding. The Law Office of Nikole M. Wynn understands that facing criminal or traffic charges is stressful and confusing. Attorney Nikole M. Wynn offers FREE consultation for all matters and she will work to help you understand your rights and the court process. The Law Office of Nikole M. Wynn offers reasonable legal fees and will provide you with an individualized quote based on your unique circumstances. Contact Attorney Nikole M. Wynn at 716-288-5254 for a FREE Consultation regarding your legal needs.